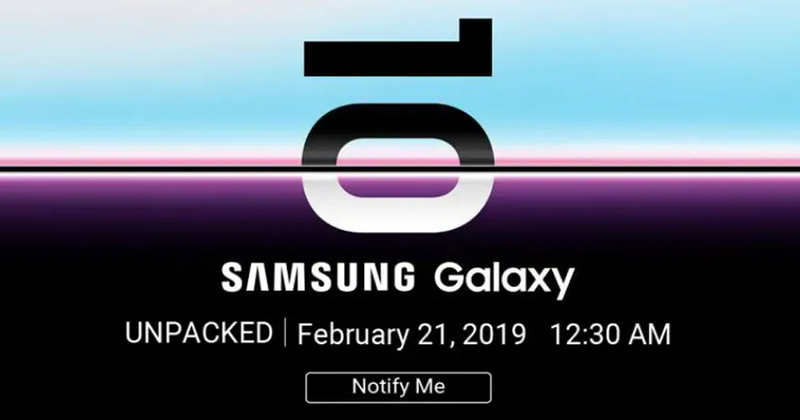 Flipkart has teased the launch of Samsung Galaxy S10 via a banner which shows the schedule as per the IST (Indian Standard Time) of the Galaxy Unpacked 2019 event. The online marketplace has also given a notify option by which one can be notified about the launch of the upcoming smartphone. It seems that Samsung is expected to launch the Galaxy S10 family in India after the launch in foreign markets. It is also expected that Galaxy Buds will be offered for free during the pre-order of Samsung S10 models in Russia and for other countries as well. The Galaxy Unpacked event was teased on Flipkart mobile app and will be held in San Francisco, California which will begin on 20 February at 11 PT (Pacific Time) i.e. 12:30 AM IST, 21 February 2019. The banner of the event on the Flipkart mobile app has the same image which was showcased on the formal invite of January. In the banner, the digit 0 of 10 is split horizontally. To get notified about the event, the customer can register themselves with their name, phone number and email ID. The banner on the Flipkart indicates that the Indian market will not have to wait for long for Samsung Galaxy S10. As per the former reports, the upcoming smartphone will come in the selected market from March 8, 2019, and the pre-orders will be taken from February 21, 2019. The Galaxy 10 family will contain regular Galaxy S10, Galaxy S10E aka Galaxy S10 Lite, and the Galaxy S10+ which will come in India after the launch in foreign markets. As per the reports, Samsung will offer Galaxy Buds for free to the customers who will pre-order the Galaxy S10 smartphones. A leading website has also included the code for the pre-order offer which will be available for other markets too. However, there were no further claims found through the Russian website. The Galaxy Buds also known as Galaxy Earbuds will be the same as Airpods of Apple which will be a wireless audio experience. As per the leak, the Galaxy Buds might also have wireless charging support.